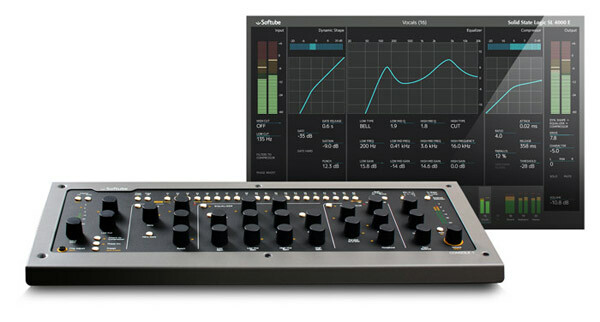 Softube Console 1 MkII : The award-winning Console 1 MkII takes the quick and intuitive workflow of a digital mixer and pairs that with the great sound of a classic analog mixer. This is why we call it "the next generation mixer"?it offers a new and much improved approach to mixing in the computer. Use one of the track selector buttons on the hardware to select the track you want to work on. Then use the physical knobs and buttons to adjust the included gate, EQ, compressor, high/low cut filters, transient shaper and emulated analog console distortion. Select a track, tweak the knobs. Select another track, tweak the knobs?that is essentially the workflow of Console 1. Included in the Console 1 package is Softube's model of Solid State Logic SL 4000 E?one of the most classic and widely used analog consoles in the world. Softube's model has been scrutinized by Solid State Logic's own experts, who have officially endorsed it. The channel strip includes the coveted black knob E 242 equalizer, the classic channel compressor, the musical expander/gate and the sweet high and low cut filters from the SL 4000 E channel. To expand the available sound palette, the Solid State Logic XL 9000 K-Series for Console 1 can be purchased separately, and more emulations of coveted analog consoles are in the works. These channels can be used to replace the SL 4000 E on all or just a few tracks, and you can even mix and match individual sections according to your own preferences?for example using the XL 9000 K gate as a part of the SL 4000 E channel. The On-Screen Display?Console 1's mixer window?gives you perfect and detailed visual feedback of the selected channel's settings. At the bottom of the window, the meter bridge displays the levels of the currently selected channel bank (unlimited number of banks, each holds 20 channels). But you also get plenty of visual feedback from the hardware. LED rings show the knobs' positions, and meters display input and output levels, as well as gate and compressor gain reduction. So for an even more analog mix experience, just turn off the On-Screen Display and use your ears! You won't get lost.